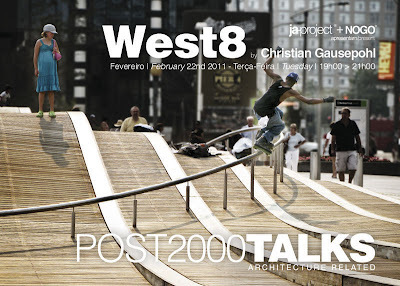 A NOGO e JA-project convidam-no(a) a estar presente na conferência de Arquitectura do estúdio holandês West 8, (apresentado pelo director de projecto Christian Gausepohl), no dia 22 de Fevereiro de 2011 pelas 18.30h. A conferência pertence ao Ciclo POST2000TALKS e terá lugar na Galeria Luís Serpa Projectos, em Lisboa. Entrada gratuita. With a multi-disciplinary approach to complex design issues, West 8 has extensive experience in large-scale urban master planning and design, landscape interventions, waterfront projects, parks, squares and gardens. We also develop concepts and visions for large-scale planning issues that address global warming, urbanization and infrastructure. Working on an international level from its start, West 8 developed projects all over the world in places such as Copenhagen, London, Moscow, New York, Madrid, Toronto and Amsterdam. The office gained international recognition with projects such as Schouwburgplein in Rotterdam (NL), Borneo Sporenburg in Amsterdam (NL), Chiswick Park in London (UK) and Expo '02 in Yverdon-les-Bains (CH).Many of the projects are the result of groundbreaking entries in important international competitions. Recently won competitions include Governors Island in New York (USA), Playa de Palma in Mallorca (ES) and Miami Lincoln Park (USA). Amongst the numerous awards received by West 8 are the Dutch Maaskant Award, the Rosa Barba First European Landscape prize, the Veronica Rudge Green Prize for Urban Design and recently the American Society for Landscape Architecture Honor Award. West 8 approaches the production of nature in two different - but characteristically Dutch - ways. First, we take a classic civil engineering approach for creating landscape - a logic based on utility and necessity. Second, we are part of a landscape tradition that confers identity and, therefore, understand the need for creating symbols in the production of landscape. This method envisions a new nature, a 'second nature' of constructed landscapes that respond to pragmatic demands (water management, population growth, traffic congestion) and also reinforce the culture to which they belong (identity, symbols, expression). POST2000TALKS é um ciclo de conferências relacionadas com a Arquitectura iniciado em Outubro de 2010. O seu objectivo é promover a troca de experiências teórico-práticas da Arquitectura, Desenho Urbano e Paisagismo ao nível global. Os convidados representam uma geração de jovens profissionais que iniciou a sua prática de estúdio/pesquisa a partir do ano 2000. O programa é definido por um alinhamento contínuo de Conversas [TALKS], apresentações de projectos e debates. 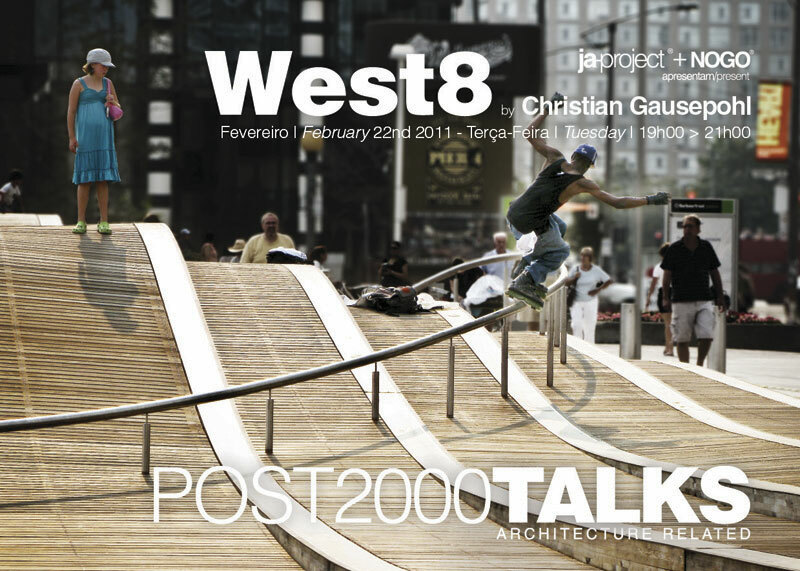 O Ciclo POST2000TALKS é uma colaboração entre JA-PROJECT e a think-tank NOGO, acolhido pela Galeria Luis Serpa Projectos,Lisboa.